Australian Government has identified infrastructure development as a priority for economic development of the country. As a result the Government is enabling the development in industrial sector and commercial sub sectors such as ICT, hospitality and healthcare, where UPS systems are used to overcome the power outages and power fluctuation problems. Further, foreign investment in Australian commercial property is staging a comeback, with hotels the most popular asset in almost every state would also catalyze the growth of UPS market in the country. New South Wales region is projected to witness the highest Australia UPS market share over the coming years on account of The NSW State Infrastructure Strategy 2018-2038 for infrastructure investment and land-use planning for the region. Further, rising investment in digital technologies for innovation in service delivery and better management of assets and to improve service quality and efficiency in various sectors through more connected infrastructure, and data and technology investment would also help New South Wales region to continue its dominance in future as well. 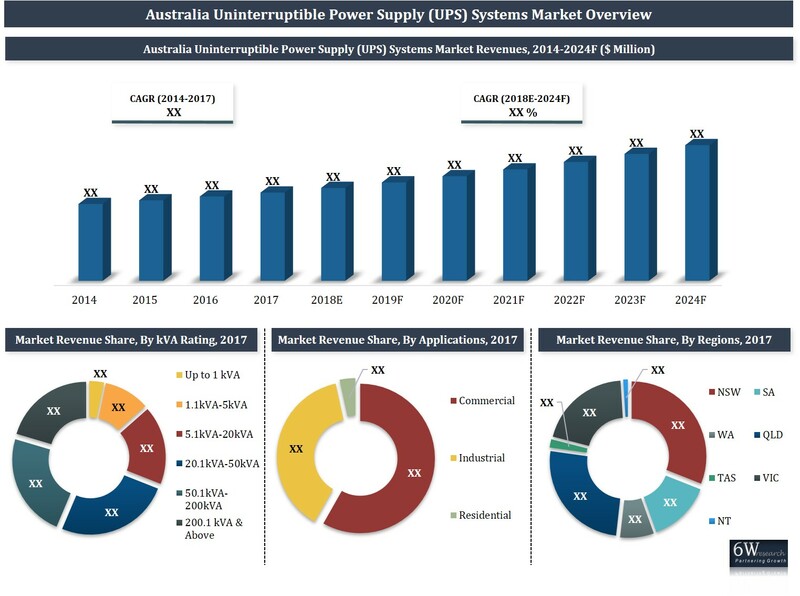 The Australia UPS market report thoroughly covers the Australia Uninterruptible Power Supply (UPS) Systems market by kVA ratings, applications and regions. The Australia UPS Market outlook report provides an unbiased and detailed analysis of the Australia UPS market trends, opportunities/high growth areas and market drivers which would help the stakeholders to device and align their market strategies according to the current and future market dynamics. 13.1 Schneider Electric (Australia) Pty Ltd.
13.2 Eaton Industries Pty Ltd.
13.4 General Electric Australia Pty Ltd.
13.8 Delta Energy Systems (Australia) Pty Ltd.
13.9 RIELLO UPS AUSTRALIA Pty. Ltd.
13.10 Fuji Electric Asia Pacific Pte. Ltd.